July 5 provided a whole lot to write about. I hope you enjoy it; it was a good day for us. 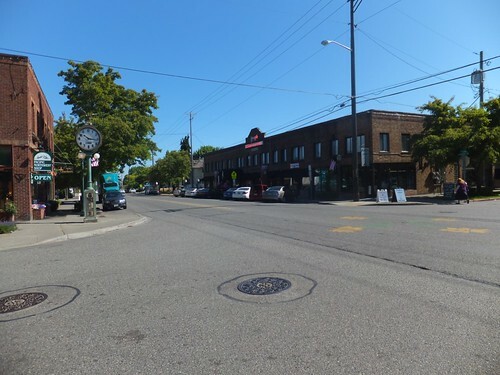 For brunch, we went to Tacoma to go to Knapp's Family Restaurant, which has been in business since 1933. 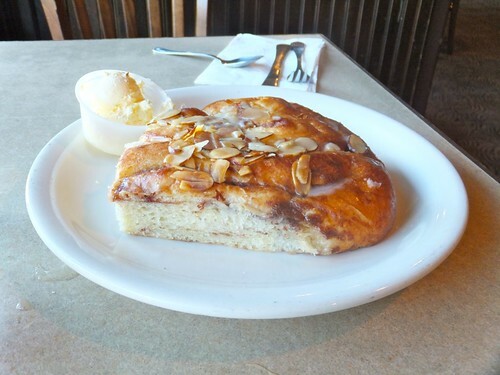 I started to describe Knapp's as a coffee shop, but that only really applies to the section that we sat in. 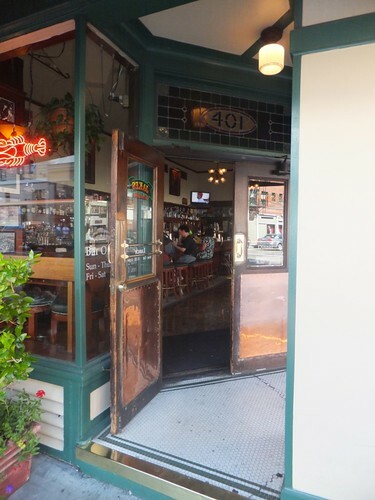 Knapp's is divided into several rooms, presumably because of expansion over the years, so the restaurant progresses from coffee shop at one end, to dining room in the middle, to bar at the other end. The roadfood.com review mentioned the butterhorn from the breakfast menu, and I'd never heard of a butterhorn, so we ordered one. I'd expected something more or less horn-shaped, but what we got was a flat spiral pastry, like a soft cinnamon roll without much cinnamon. 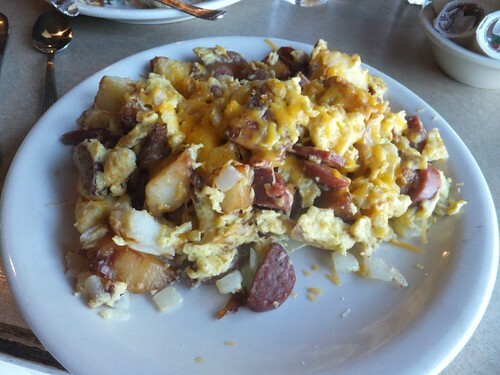 I had the kielbasa scramble, and it was excellent. I really loved the vigorous flavor of the sausage. 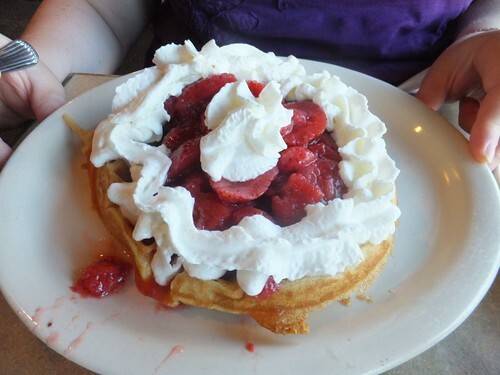 Lori got upsold by the waitress's banter to the waffle with strawberries and cream. From Tacoma, we had to hustle to Portland. 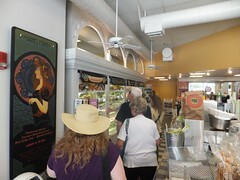 We had purchased advance tickets for an Epicurean Excursion from http://www.portlandwalkingtours.com that started at 2pm. I had calculated that we could get there about 1:30... but we lingered a few minutes extra at Knapp's, we had to stop at a rest stop in Washington, we hit a touch of traffic somewhere - so the net result was that at 2pm, I was driving through Portland trying to find the recommended parking garage, and Lori was on the phone with the tour folks trying to figure out whether there was a way for us to catch up to the tour. We dashed to Cacao, a fancy chocolate and hot chocolate place that was the first stop, and were excited to see that there was a tour group there. But when we accosted the guide, he told us that this tour group was not our tour group; ours had gone on to the next stop. 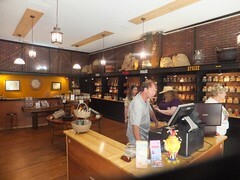 So we hustled down to the next stop without taking time to peruse the lovely chocolates, which made Lori very sad. Fortunately, we did catch up to our tour group at the next stop, Benessere. 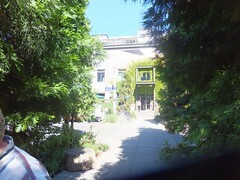 (And the tour guide had even brought us sample's of Cacao's hot chocolate.) 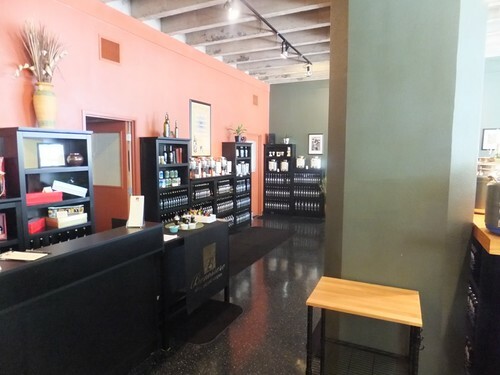 Benessere ( http://www.oilgoodness.com/ ) is a tasting bar for olive oils and balsamic vinegars. This was interesting to me, because I generally do not notice much variation in taste among olive oils, and I was glad to have some guidance there. I did think I identified the cut-grass notes that were mentioned in one of the olive oils. I also remember that the guide mentioned "pepper" as one of the qualities of one of the oils, and described it as a little prickle in the back of the throat. I've felt that prickle before, though I didn't in that particular oil, but that prickle doesn't match my expectations of what "peppery" would mean at all. 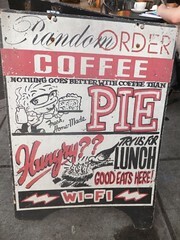 Part of me finds this very cheering - it means that I am not alone in my struggles to find expressive food vocabulary. A random shot of a large-scale chess game that we passed on the tour. I'm not good enough at photo editing to make this clear, but one of the white knights is being played by an understudy of a white laundry basket. 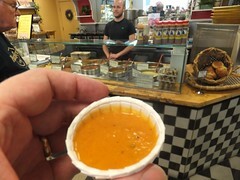 At Flying Elephant Deli, we sampled the tomato soup. The secret ingredient turned out to be orange. Lori really enjoyed this. 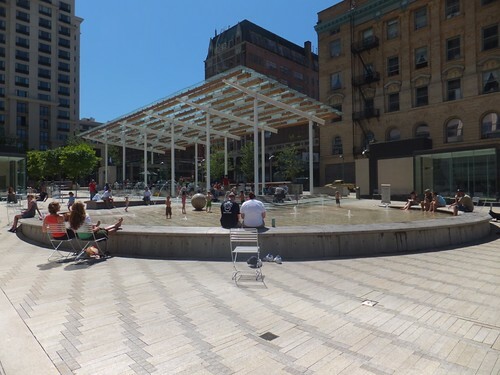 The guide asked if anyone in the group was a teacher, and when Lori said she was, he declared that Teacher's Fountain was for her. 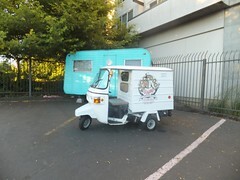 Portland has a thriving food cart scene, and the tour stopped at one food cart among a parking lot full of carts. 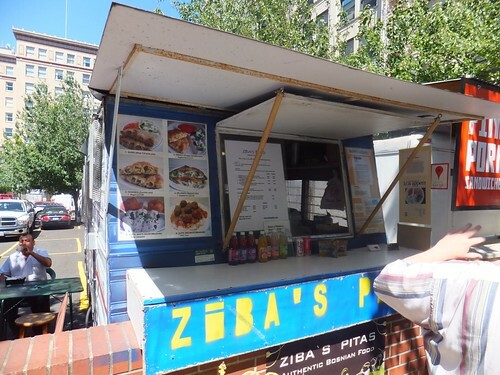 We enjoyed the chance to chat with Ziba of Ziba's Pitas. 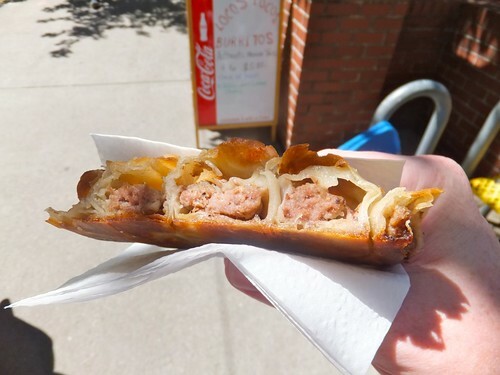 The burek we sampled was not really a pita as I'm familiar with pitas; it was a delicious spiral of seasoned meat wrapped in flaky, crunchy pastry. 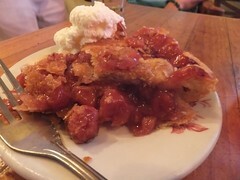 It was delicious, one of my favorite foods from the tour. 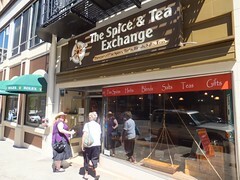 At the Spice and Tea Exchange, we sampled five different salts. The only one that tasted clearly different from the others to me was the smoked salt, which was good enough that we bought a little to bring home. 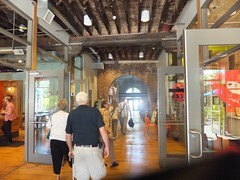 Hotlips Pizza is an anchor of the EcoTrust building, a former warehouse renovated to a high degree of eco-friendliness. 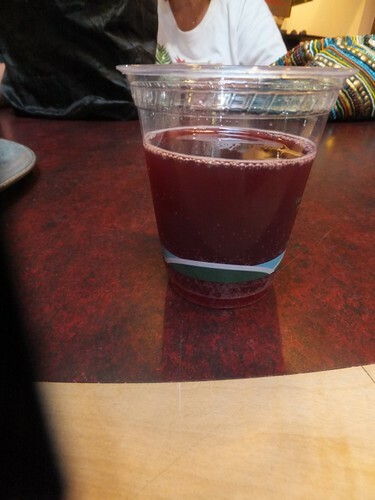 We sampled their excellent housemade blackberry soda (made with local berries) and a good kale, red pepper, and onion pizza. I don't know that I would seek out kale on a pizza again, but it was pretty good. 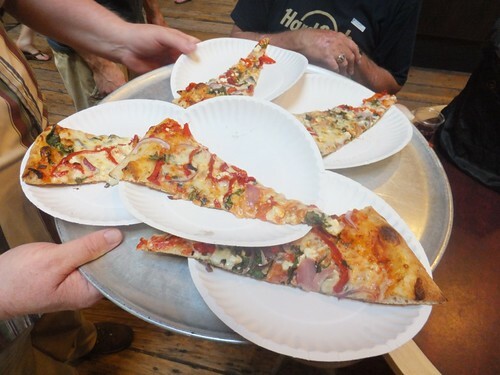 We were told that the owner of Hotlips Pizza has a number written in his office of the total mileage for every ingredient of his pizza to come to the restaurant, and he strives to reduce that number every year. Though we sampled nothing at this bar, our guide told us that the tiled trough between bar and barstools had historical significance. 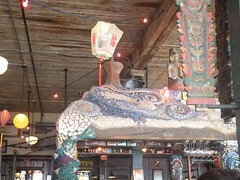 The bar was built in the late 1800s, and at that time, women did not enter bars - so the male patrons used that trough as a place to, ahem, dispose of used beer without needing to step outside. I'm not sure whether this was true or not, but it was corroborated by a picture in a men's room I saw later on our trip. 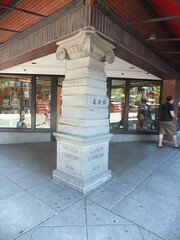 I don't exactly remember the story behind this sculpture; perhaps one of my readers can clarify matters. 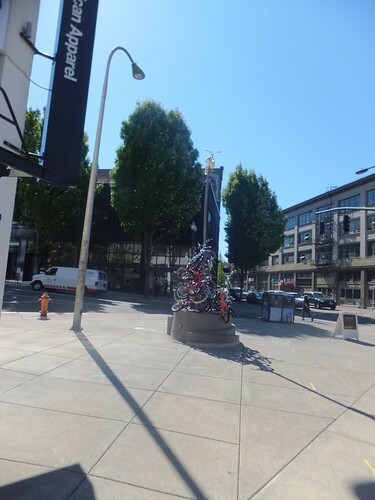 As I recall the story, there was a Portland tradition of people riding down a hill on these teeny toy bikes, and this was erected both as a piece of public art and as a place to store the bikes so they wouldn't be scattered everywhere. 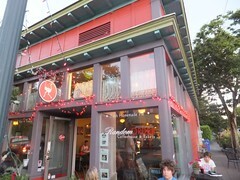 McMenamin's is a chain of microbreweries in the Portland area that is now up to 29 breweries serving 58 locations. All the locations are restored sites; this one was called the Crystal Ballroom, because it once hosted a taxi-dance hall on an upper floor. 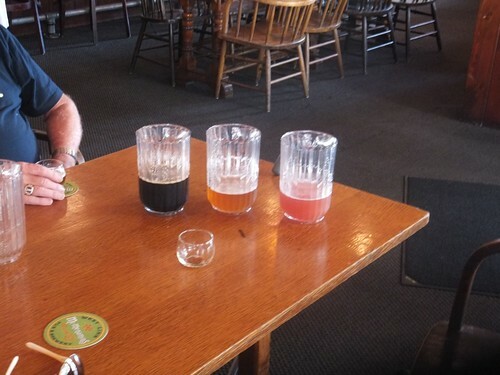 We sampled their "ruby" beer made with raspberries, a lager, and the "Terminator Stout", none of which delighted me. 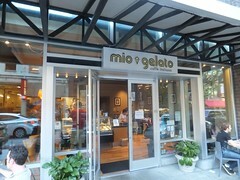 Our last stop on the Epicurean Excursion was Mio Gelato, where we sampled coconut gelato, chocolate hazelnut gelato (with local hazelnuts), and plum sorbetto, all very good. 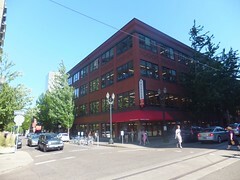 That final stop left us very near Powell's Books. I didn't feel a great need for books; because we were flying, I was using the iPad to serve my reading needs for the trip. But I would have felt disloyal to my principles had we not gone in, and I bought a couple of books as a token gesture to thank them for being Powell's. That evening, we joined esteemed Roadfooder mr chips and his wife Trudy. 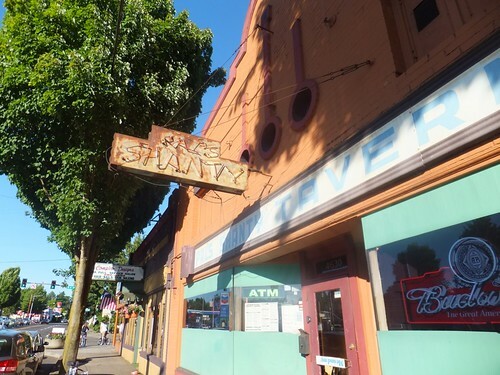 For dinner, we accepted their recommendation to eat at a seafood joint named Pal's Shanty. 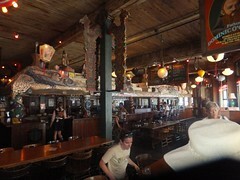 I recall mr chips pointing out that all the seafood was fresh-caught, and there was not even a freezer on the premises. We shared an enormous sampler platter. 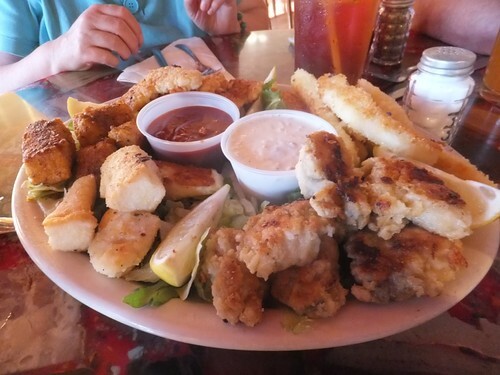 If I was trying to make the best trip report I could, I would have taken better notes about what was on the platter; our notes just say "fried platter o' seafood". I remember halibut fritters (on the left) and calamari (in the upper right), but I can't recall the other items. I particularly remember the calamari because it was very different from other calamari of my experience: it was finger-size pieces of fried squid that were extremely tender and tasty, quite unlike the rubbery rings I usually get as calamari. 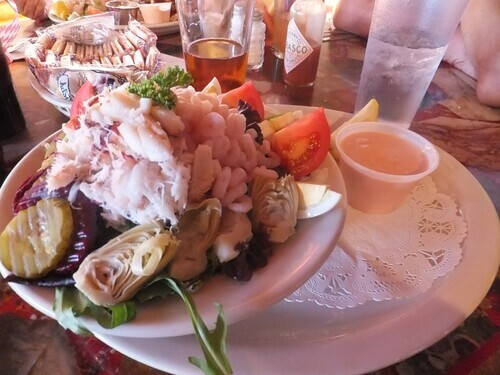 I had the Crab Louis. This was a very fancy version, with artichoke hearts and hard-boiled eggs and other such goodies. I enjoyed it a lot. 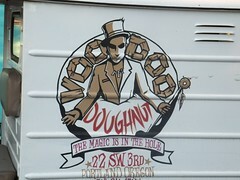 After dinner, mr chips led us to a suburban location of Voodoo Donuts. 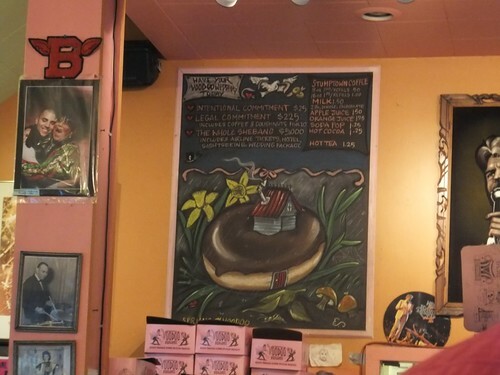 I can emphatically and euphemistically state that Voodoo Donuts has an atmosphere all its own. 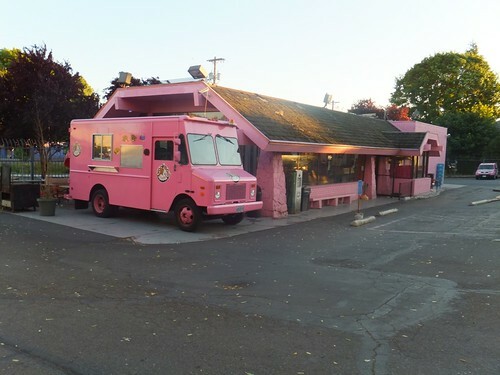 Voodoo Donuts offers wedding packages at a very reasonable price. 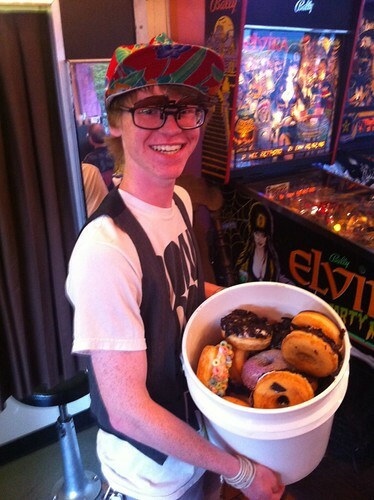 I was sufficiently intrigued by this young man and his bucket of donuts that I asked him whether he was a staff member. 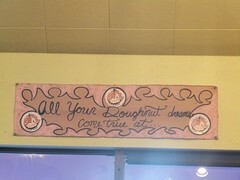 No, he was just a donut fan; we later saw him and a young woman sitting together cheerfully eating their way through the bucket. 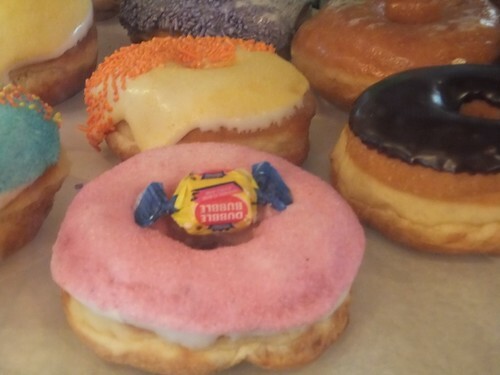 We ordered the Mango Tango donut ("filled with mango jelly and topped with vanilla frosting and tang") and the Voodoo Doll; mr chips added the Bacon Maple Bar. 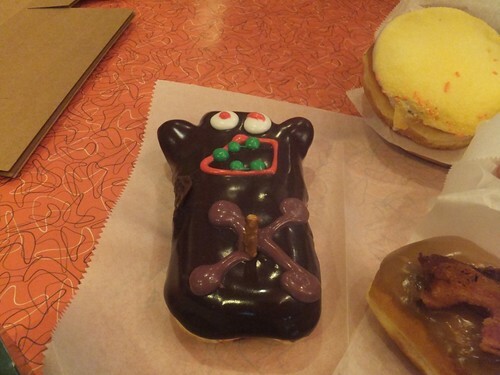 Of these three, my favorite was the Voodoo Doll; it was a chocolate-covered donut filled with raspberry jelly, making it one of the tastier forms of symbolic cannibalism. The Mango Tango was too sweet for my taste, and I didn't feel that the flavors of the Bacon Maple Bar melded together into any whole, but just stayed as separate flavors. 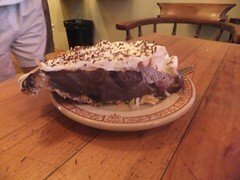 From there, mr chips led us to Random Order Coffee for a second dessert of homemade pie. 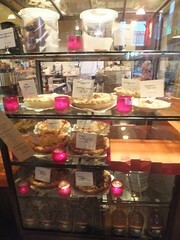 Lori chose the chocolate cream pie; I got the Oregon cherry pie. 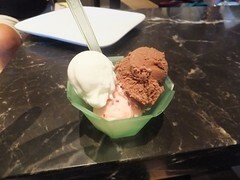 Both were quite good. We had a lovely evening with mr chips and Trudy, and really appreciate their hospitality.